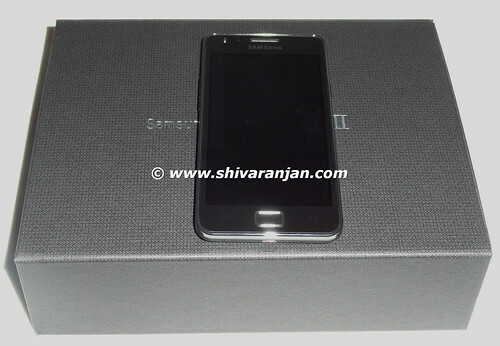 Samsung Galaxy S II is the current flagship Android device from Samsung stables, this phone has been the most sought after phone and has drawn lot of attention to itself . In this review we shall see whether this phone lives up to the attention and coverage it has got in the tech world. What is the the box? 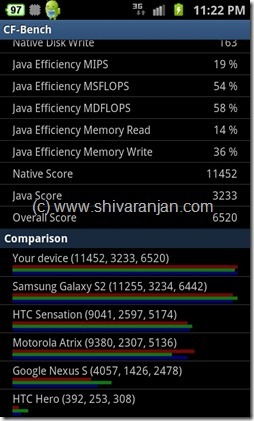 Galaxy S II GT-i9100 phone. 1650 mAh Lithium ion battery. Portable travel charger rated at 0.7A. Stereo headset with ear buds. 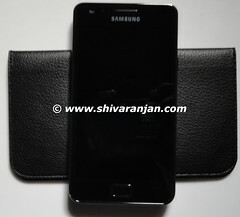 For more pics of Galaxy S II refer to the unboxing post. Cellular Data Connectivity GPRS, EDGE and 3G HSDPA with 21Mbps download and 5.76 Mbps upload. Storage 16GB internal and upto 32GB using microSD card. Display 4.3” Super AMOLED Plus technology with 800×480 pixels and capacitive touch screen. The screen made out of Gorilla glass. Connectivity Bluetooth 3.0, WiFi: 802.11a/g/b/gn (2.4GHz/5GHz), WiFi Direct, USB 2.0 micro USB port, GPS with A-GPS, 3.5mm audio jack, HDTV out and USB on the GO. Sensors Accelerometer, proximity sensor, gyroscope sensor, ambient light sensor. Battery 1650 mAh Lithium ion battery. 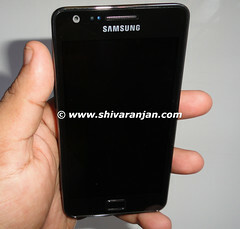 Samsung Galaxy S II when held in hand feels extremely light and sleek. It feels so light that you never feel that you holding a big phone with 4.3” screen and the phone is super thin with only 8.49mm in thickness. If you have been using phones with 2” to 3.5” screens then you feel that the 4.3” is quite big. 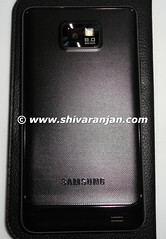 While holding the Galaxy S II you get good grip on the phone due to the textured rear cover. The phone is sleek but it is entirely made of plastic hence it does give plastically feel but it doesn’t feel cheap. It is the use of plastics which makes this phone light weight. The phone just weighs 116 gms with dimensions 125.30 x 66.10 x 8.49mm and you feel intrigued when you look at the specs that how did Samsung fit all these within this frame. Holding this phone and using does initially feel little cumbersome as it feels huge and it takes a while to get comfortable with this phone. The front of side of the phone houses the massive 4.3” super AMOLED plus screen covered with Gorilla glass coating. You will find the Home key (physical button) and two capacitive buttons towards the bottom of the screen. The ‘menu’ capacitive button is located on left hand side of the home key and on right hand side of the home button you will notice the ‘back’ capacitive button. To use the home key you have to physically depress it and it does feel slightly wobbly at times. I feel Samsung should have provided a capacitive home key instead of the physical key. I had got used to using Nexus One and Nexus S phones and I do miss the ‘search’ capacitive key which I have grown used to on these phones. On the top of the screen from left hand side you will find the front facing 2MP camera, proximity sensor, ambient light sensor and handset earpiece. The gorilla glass coating is a very useful feature as it protects the screen from getting scratched on day to day usage. Having gorilla glass doesn’t mean that screen is impossible to scratch but it is only resistant to scratches, If you don’t want to take chances then you can opt for aftermarket screen protectors that are available. The right hand side of the phone has the power button and other than that no other buttons or controls are present. The left hand side of the phone houses the volume rocker and the lanyard eyelet. The bottom of the phone has got micro USB port that can be used to connect it to the computer and also used charging port. You can find the mic next to the micro USB port. The 3.5mm audio jack and the dedicated noise cancelling mic can be found in the top of the phone. 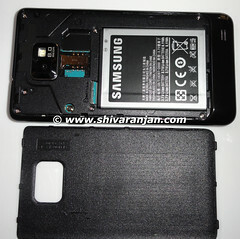 The rear side of the phone houses the 8 MP camera with LED flash and the external loud speaker can be found towards the bottom right hand side. The camera assembly protrudes slightly and if not used with care can get scratched. The rear cover is very thin and flexible and gives an impression that it might snap if not handled carefully. On opening up the rear cover you can see the SIM card slot just below the camera assembly. The micro SD card slot is located just above the battery compartment. The placement of the micro SD slot makes it impossible to hot swap the micro SD card, to remove or add micro SD card the battery would have to be removed. I felt that if the placement of SIM card and micro SD card could have been swapped as that would have allowed to add or remove micro SD card without the need to remove the battery. The other thing that I feel missed out here is the absence of a kick stand, the kick stand can be very useful for video calls/chatting and watching videos. Galaxy S II being the flagship device from Samsung the kick stand should have been nice feature to the phone. 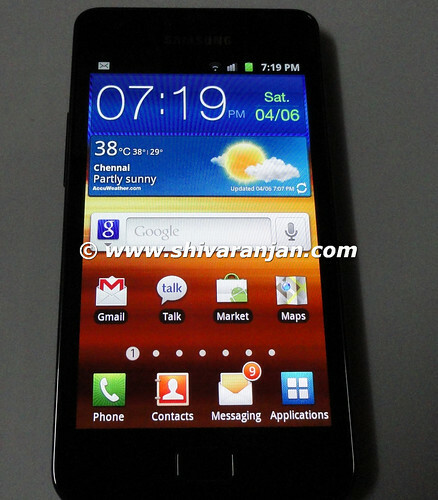 The Samsung Galaxy S II comes with a gorgeous 4.3” Super AMOLED Plus screen (RGB pixel arrangement) with capacitive touch. The glass used is Gorilla glass which is scratch resistant and it also has got an oleophobic coating that resists smudges and finger prints. The screen resolution is 800×480 pixels which when combined with 4.3” screen provides good screen real-estate space. 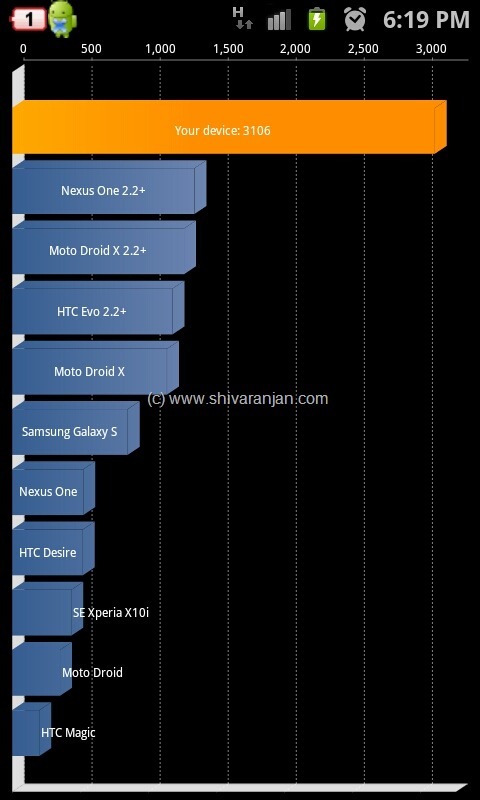 The capacitive touch screen is very responsive and in my opinion the touch sensitivity is much better than Nexus S and iPhone. The photos and videos look stunningly beautiful and rich with Super AMOLED Screen Plus screen. The display is sharp, crisp, screen looks good when viewed from many angles and the contrast is brilliant . 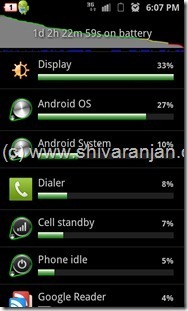 The screen is usable in sunlight only when it is set to maximum brightness anything lower than that makes the screen very difficult to use and keeping the auto brightness enabled is very useful when moving outside so that the screen can switch to appropriate brightness based on the outside lighting. Many users of XDA forum have reported about the yellow tinge issue which I can confirm exists but you will hardly notice it while using the phone and this issue is not a deal breaker. I have installed close to 150 apps and the phone runs without any hiccups. All the games that I have installed run with blazing speed but the sad part is that you cannot run or install Tegra exclusive games but if you search around the XDA forums you can figure out how to run Tegra exclusive titles on your Galaxy S II. The version of Galaxy S II comes with 16GB internal memory out of which 2GB is allocated for apps (/data) and ROM and 11.5GB is available for user to store music, videos and photos. If this space is not sufficient then you can pop in a micro SD card, the phone accepts micro SD cards upto 32GB. 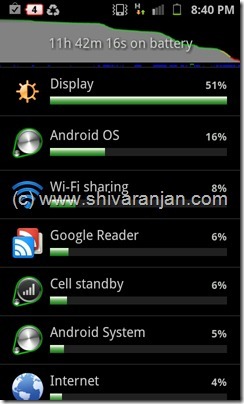 The Galaxy S II comes with a decent 1650 mAh lithium ion battery. Most of the Android phones come with 1300-1500 mAh battery capacity but Samsung has managed to stuff in a 1650 mAh battery which is appreciated considering the dimensions of the phone. 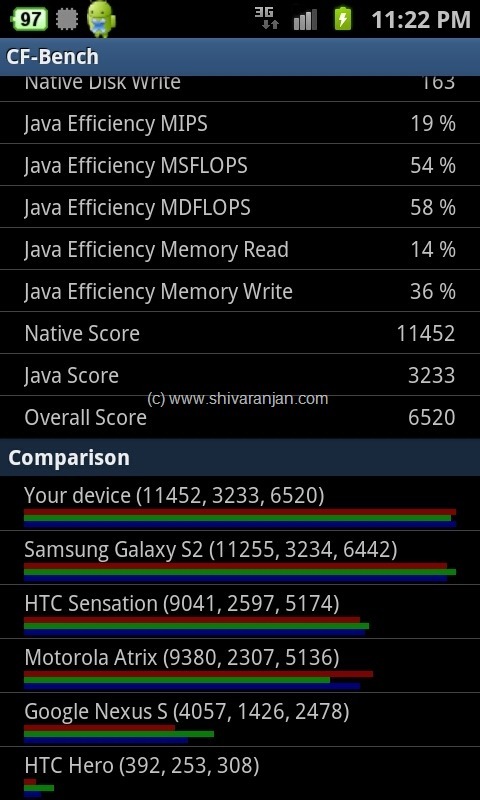 The battery life is not best in class but it is quite usable and acceptable considering the hardware. 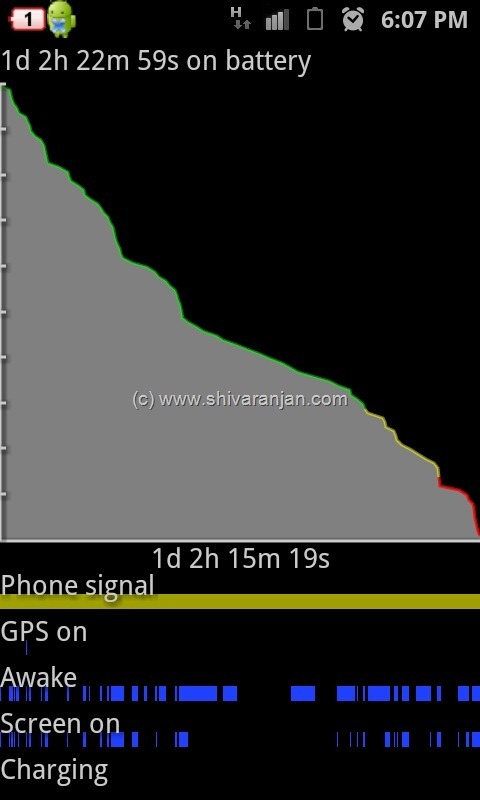 With this usage the phone lasted me close to 12 hrs (11 hrs 42 mins to be precise) which is quite good for an Android phone. Conditions: Auto brightness ON, Gmail/Exchange sync ON, 2 hrs browsing over 3G, 30 mins browsing over Wi-Fi, 45 mins voice calls, 50-60 text messages, continuous whatspp, Google maps for 10 mins, frequent twitter/facebook usage, Google Reader app usage for 45 mins and always 3G data ON with no Wi-Fi at all. 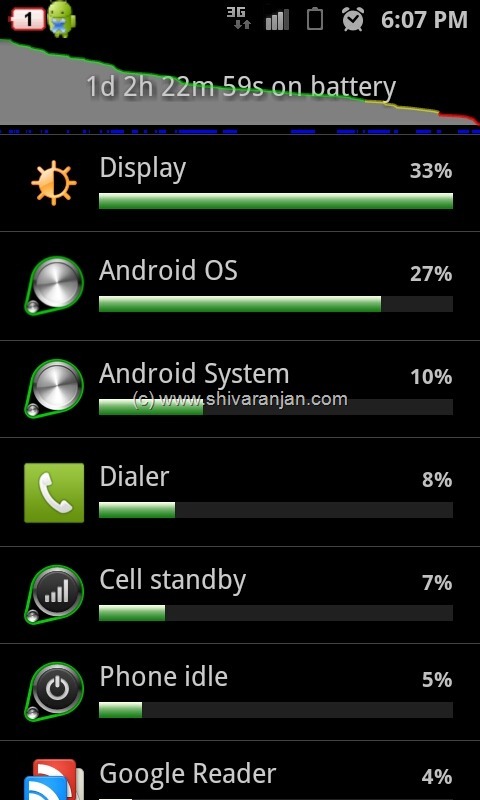 with this usage I was able to pull 1 day and 2 hours i.e 26 hrs 22 min with a single charge which is quite good. Conditions: Here conditions are same scenario 1 but instead of 3G all data related activity was performed using only Wi-Fi and no 3G tethering. 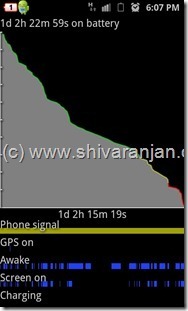 With this usage the phone lasted me around 18 hrs which is quite acceptable. 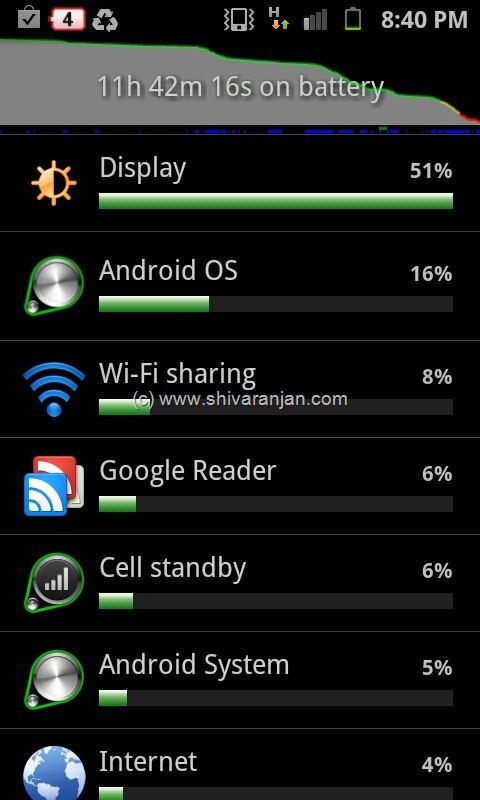 Looking at these figures the battery life is quite good and one can easily pull a day off with Galaxy S II. The Galaxy S II comes with a wide range of connectivity options. The GSM module supports 850MHz, 900MHz, 1,800MHz, 1,900MHz 2G bands and 850MHz, 900MHz, 1,900MHz, 2,100MHz 3G bands. 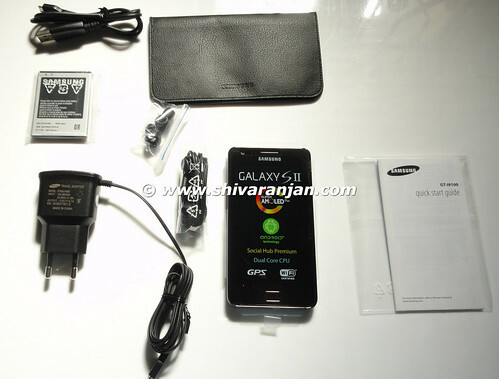 Galaxy S II comes with Bluetooth 3.0 and WiFi: 802.11a/g/b/n with Wi-Fi direct capability. I could not test the Bluetooth 3.0 functionality as I did not have any Bluetooth 3.0 device with me for testing. The GPS functionality uses the A-GPS method and is very quick to get a lock on your position, it took around 30 secs to get a lock from a cold start and around 8-9 secs from hot start. 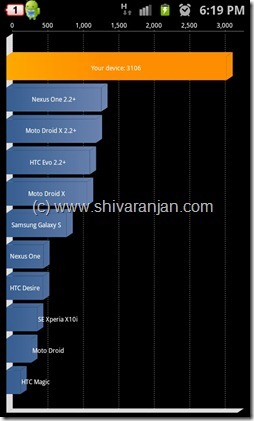 I can say that the GPS performance of Galaxy S II is better than the Nexus S and Nexus One. The micro USB slot which is provided can be used to the mount the internal memory and micro SD card in USB mass storage mode. One of the most notable features of the Galaxy S II is it can act has a host to USB devices which means that you can connect USB devices like flash drives to phone, this is called as USB on the GO. However to use this feature you need to purchase a separate MHL adaptor but this is not included in the standard package. The MHL adaptor can be used to use the HDTV out functionality to connect to HDTVs. The Galaxy S II also comes with NFC connectivity but unfortunately this feature has been not provided for the Indian variant of the Galaxy S II. The software experience, camera and other areas would be covered in another post in next few days hence stay tuned. Next post: Google Plus (+) : How to Delete a User Comment from your Stream/Post?